Christoph was an elemental member of the crew for Voyage Alaska 2005. 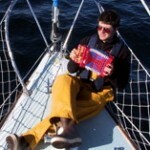 He spent his college years as a US Sailing instructor for the University of Wisconsin. He has spent several years sailing the waters of the Pacific NW from Oregon to Alaska. Pacific NW Expeditions calls upon Christoph when the route demands heavy-weather sailing and 24-hour watch-keeping.